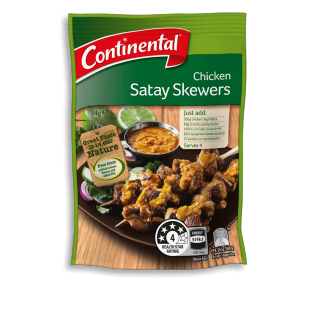 Made with real cumin, onion, garlic & turmeric, Continental's Chicken Satay Skewers will deliver a delicious dish the whole family will love. Learn more here. Where can i buy this product? Seems no supermarket stocks this... why publish a recipe in coles food magazine if product not avaiLable?? Hi, our Chicken Satay Skewers have been deleted for quite a qhile now, so we're really surprised to hear that you've seen them in a Coles Food Magazine. Was it a recent issue? So Sad these are gone, bought the last of super market stock and am starting to run low..
we eat these all the time. Best tasting satay other than going to Thailand. WHere can we buy stock? Hi, sadly our Chicken Satay Skewers Recipe Base has been deleted due to lack of sales. Thanks Rosemary! Countdown stores in New Zealand still have these in store but we're not sure if the Australian customs would require you to declare these food items when you return to Australia. Best mild satay around! please bring it back!! Best satay sauce i have ever had. my whole family loved it. maybe if you advertised it and kept it on the shelf longer people could have seen how good it was. very disappointing.